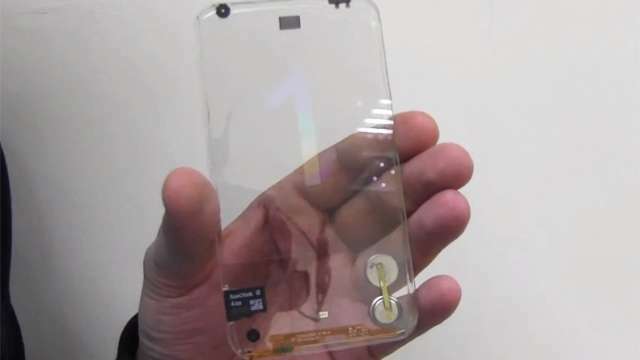 In a revolutionary development, a Taiwanese company claims to have developed a gen-next transparent smartphone which it says will be in the market by the year end. The company, Polytron Technologies, has already begun marketing a transparent multi-touch phone. Its prototype uses a ‘Switchable Glass’ technology. That is a conductive Organic light-emitting diode (OLED) using liquid crystal molecules to display images, the ‘Daily Mail’ reported. When the phone is in off mode, the molecules align to form a milky composition, but when switched on they re-align to form text, icons, and other images. Electric current is carried through transparent wires. “It will happen near the end of 2013. Trust me,” said Polytron general manager Sam Yu. The device still contains some parts that are not transparent, including a SD card and SIM card. The microphone, camera, and batteries are also visible, and will be hidden behind a dark glass cover when the model goes into production. The company, according to Yu, will develop a smaller lithium ion battery that would be much less noticeable. When complete, the phone will have a dual-sided multi-touch display in front and back. The prototype phone has yet to feature any software or operating system, the report said. A Japanese company recently used a transparent liquid crystal display (LCD) in its wristwatch but had trouble adding hardware to the smaller frame. “The challenge of using a transparent display in a wristwatch, and I suppose other wearable technology, is that you need to store the batteries somewhere else (usually they are stored behind the LCD panel),” Tokyoflash marketing manager Paul Cooper said. It remains to be seen whether the phone’s transparency by itself will attract buyers, as the prototype does not offer significantly different functions than most smartphones. “Display quality is paramount,” Avi Greengart, research director at Current Analysis, told The Verge. “If the display quality is not up to par with the best of today’s AMOLED and LCD screens, a phone using it won’t sell even for its novelty value,” said Greengart. Polytron plans to assemble working prototypes of the transparent smartphone and even move toward limited production by the end of the year, according to Mobile Geeks.